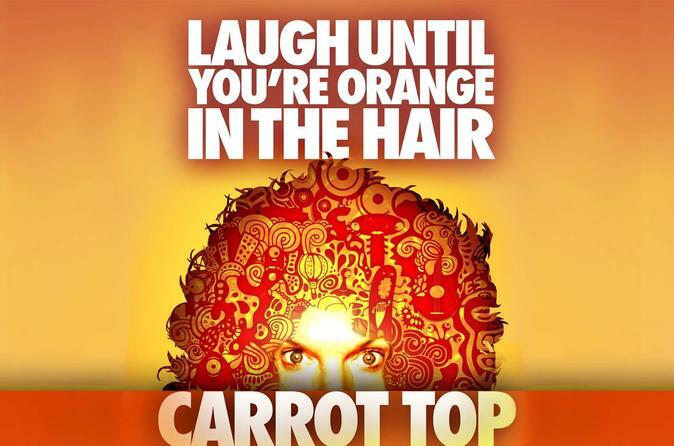 See Carrot Top's high-energy, prop-based comedy show at the Luxor Hotel and Casino on the Las Vegas Strip. With his signature mop of red hair, the instantly recognizable comedian keeps the laughs coming in an over-the-top show featuring everything from lasers to fog machines to confetti cannons. Enjoy premium seating for this show by a famous comedian who's been in the business for decades! Go to the Luxor Hotel and Casino on the Las Vegas Strip for your spirited evening performance by comedian Scott Thompson, better known as Carrot Top. A long-time Vegas headliner, Carrot Top started performing in small clubs in the 1980s and was the highest-grossing touring comedian in the US by the late 1990s. With breathless enthusiasm, he mixes puns, props, commentary on current happenings and reflections on everyday life. In his frenetic, elaborate stage show, the redheaded comedian pulls props and wacky inventions out of trunks, telling jokes about each one before discarding it. Prepare for sensory overload as Carrot Top presents his own unique brand of comedy amid lasers, loud music, fog machines, flames and confetti cannons. If you're in the mood for a night of laughs courtesy of a proven comedy powerhouse, this 1.5-hour spectacle is for you!